New Delhi: External Affairs Minister Smt. 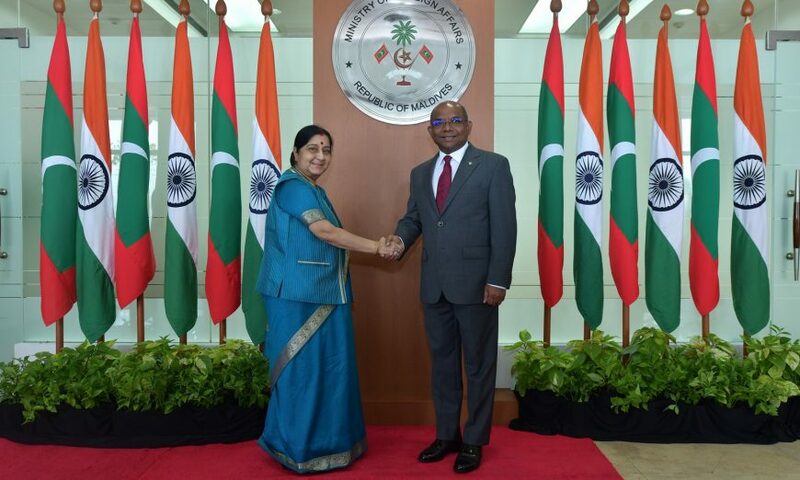 Sushma Swaraj, was paid a visit to Male, Maldives from 17-18 March 2019 at the invitation of H.E. Mr. Abdulla Shahid, Foreign Minister of Maldives. She was accompanied by Foreign Secretary Vijay Gokhale and other senior officials. During her visit, she was having a bilateral meeting with Foreign Minister Shahid, delegation level meetings with the Minister of Defence Mariya Ahmed Didi, Minister of Finance Ibrahim Ameer, Minister of National Planning and Infrastructure Mohamed Aslam, Minister of Health Abdulla Ameen, Minister of Transport and Civil Aviation Aishath Nahula, Minister of Arts, Culture and Heritage Yumna Maumoon, Minister of Environment, Dr. Hussain Rasheed Hassan, and Minister of Economic Development Fayyaz Ismail. The Ministers reviewed the entire gamut of bilateral relations and discuss future programme of action. EAM was called on the President of the Republic of Maldives His Excellency Ibrahim Mohamed Solih on 18 March 2019 and the Speaker of the Parliament His Excellency Qasim Ibrahim on 17 March 2019. The Minister of Home Affairs Sheikh Imran Abdulla was called on EAM on 18 March 2019. India attaches the highest importance to its relationship with the Maldives which is marked by trust, transparency, mutual understanding and sensitivity. This visit was further strengthening the close and friendly relations between India and Maldives.